Convenient parking is available for the Julia Ideson Building. View the map shown for more information on all parking options, including rates, hours of operations, and entrances. 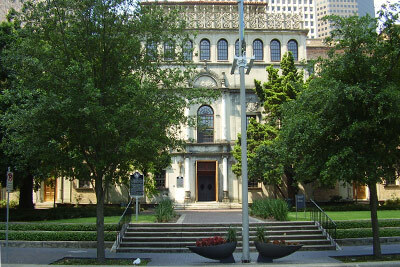 The Julia Ideson Library is a restored historic building in downtown Houston that now serves as home of the Houston Metropolitan Research Center, and provides offices to staff members of the Houston Public Library and Houston Public Library Foundation. The Reading Room and Exhibit Hall are open to all during regular library hours, and rooms are available for rent to host special events. There are also tales about the building being haunted by the ghost of Jacob Frank Cramer, a library caretaker, and Petey, his dog.